The project may have started with a miscommunication, notes Dave Garton, but that amusing incident never stood in the way of his creating a beautiful sunken pond -- or of campaigning to ease neighbors' fears about a significant (but temporary) disruption of their bucolic lives. 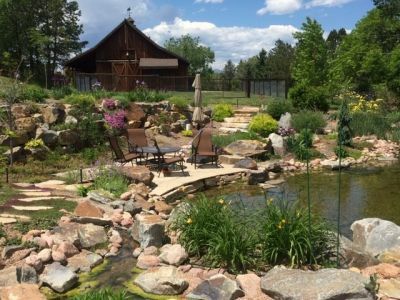 This project came my way as a lot of them have through the years: A landscape contractor had been tasked with organizing things on a large estate property and called me in to work with the homeowners on the pond they wanted. I was in complete agreement with her, but I’m a bit hard of hearing: I understood her to have said “ah-ha effect,” which made perfect sense given the low-lying area and the happy opportunity I would have of using her suggestion to make the pond and its surroundings an unfolding visual surprise for anyone approaching it. I had no problem with the split-rail fence that eventually appeared to maintain the unobstructed ha-ha view, but it wasn’t until a conversation with her some years later that we recognized the extent of my hearing impairment and had a good laugh about how things had turned out despite the miscommunication. The estate in question is in Cherry Hills Village, Colo. – an upscale enclave near Denver filled with big homes on very large lots. By the time I arrived, a barn was under construction, and I learned that it was being built using blueprints from the original found at Walt Disney’s childhood home. This detail alone spoke volumes about her desire to personalize the place to meet their very particular desires. The pond, I learned, was among the most important to them of all of the features the landscaping project was to include. I also soon discovered her habit of visiting the pond area daily throughout the construction process. Happily, she and I became friends pretty quickly, and I would report to her almost daily about what we’d accomplished since her last tour. As is true with most projects of this kind, the initial disruption is a source of great concern to homeowners, with the spoils from the excavation quickly being joined by huge piles of rock, lots of equipment and a huge liner. The ideal place for the pond was in a large, sunken, boggy area on the edge of the property where, years earlier, the homeowners had planted a fair quantity of water-loving sedges we intended to save for subsequent replanting. As we started our work, the Disney-replica barn was under construction just a few yards away. Since it was apparent she wanted to be involved, I wanted to oblige – but her schedule made things difficult. Often for example, I will often take clients to a local stone supplier and have them select (with my guidance, of course) a few key boulders. As these major stones slide into place, I’ll remind them of the field trip and bring smiles to their faces. I couldn’t develop that stony form of emotional involvement for this client, but we found other, smaller ways to forge links for her. Almost on a daily basis, I also found that neighbors walking their dogs or riding their horses would be a substantial, persistent presence as well. This is the kind of place where everyone easily gets involved in everyone else’s business – and I know from experience that complaints to the city about any minor disappointment can tie up a project for days or even months. So I was just as forthcoming with these passersby as I was with my clients, explaining that the piles of rock would disappear down into the hollow and that all would soon return to normal along the path. The upshot of all this was that my crews made fun of me as I spoke with the clients or approached people on the path, joking that it was “time for Dave to take another long break.” But in reality, this bit of public relations was as important as anything else I did on the job site; and yes, I did need occasional breaks because my back isn’t as cooperative as it once was. Despite these work-related distractions, my crews knew what we were after and the installation process moved along at a good pace. Before long, the piles of material we’d carried on site had all been rearranged and gradually faded from view. Once we’d excavated the pond area, we set up two large bog filtration areas and placed all of the necessary plumbing in place. The special-order liner was huge and heavy at 100 by 150 feet – so cumbersome that we had to set up fans to blow air beneath the rubber to make it billow up for easier adjusting and placement. We set up our bogs so that water rises up through the gravel and roots, giving the plants ample opportunity to benefit from nutrients in the water. But before the water gets there, it passes through a large mechanical filter that clears away heavy debris and fish waste. We do this so the need for maintenance within the pond itself is kept to a minimum. Everything we pursued on site was intended to meet another of the homeowners’ requirements: They very much wanted the pond to attract wildlife – and they certainly have seen their wish come true! The project’s location along the community bridle trail made this a very public exercise, and I spent a good amount of time almost daily in public-relations efforts aimed at quelling neighbors’ fears that the rising stocks of earth, stone, pond lining and equipment that arrived at the start of the project would be anything more than a quick-passing visual inconvenience. For safety reasons, the pond is relatively shallow – nowhere more than two or three feet deep. This made sense next to a public path with minimal fencing, but it also meant the fish the homeowners wanted to include have existed in a smorgasbord for the herons and other predators that appeared almost as soon as the pond was filled. To stock the pond, they brought in bluegills and minnows. Early on, someone tried with a few koi and goldfish, but those vanished down some heron’s gullet almost immediately while the duller-appearing fish have thrived – and enough of them manage to avoid becoming snacks for predators that the homeowners are able to visit with them every day. But of course, the water needs restocking every spring. In a special request, she let me know that she really wanted crawdads in the pond, so I went out to a local stream and tried unsuccessfully to net up enough of the little guys to get a colony started. The one freshwater crustacean I managed to catch that day had a nice life, but I can’t help thinking he was lonely there, all alone with the bluegills and minnows. In rapid order, the pond’s hydraulic components settled into trenches arrayed around the large but relatively shallow basin. Once we started placing boulders and shaping up the wetland areas, both our clients and their neighbors could see that we were as good as our word about the temporary nature of the mess – and that what had been a blot on the community’s sense of calm for a couple weeks was being replaced by something everyone would enjoy. Ducks and frogs soon became a steady presence, too, with deer, foxes, coyotes and other common Colorado wildlife occasionally joining the parade. Once the barn was finished, some turkeys joined the show – including a Blue Slate Turkey, which is so large and such a bright blue that the herons suddenly stopped abusing the pond at mealtimes. As things were taking shape, she suggested adding an island that would encourage some critters to stay around and feel safe. That idea worked out beautifully, with a large quantity of frogs taking up residence along with some nesting mallards. But one day the homeowners noticed that the frogs were gone. This is when they discovered that two garter snakes had also taken up residence – over in the nooks and crannies of the stone wall behind the pond – and had been enjoying a great (but finite) food source. As was mentioned above, the pond took shape in a boggy area that was choked with sedges (which she had planted years before) and various other plants when we initially arrived. Instead of destroying everything in the excavation process, we dug out large quantities of the sedges as big clumps and set them aside for later reintroduction. We were concerned that they might suffer once they were removed from the saturated ground – and although we watered them steadily, they looked increasingly unhappy as our work proceeded. But once we replanted them, we were amazed at how many of them immediately rebounded – and at how few of them didn’t take to their new homes in the bogs and around or within the pond. The homeowners have thrived with the new environment as well. They had told me that their intention each evening (weather permitting) was to walk over to the pond, drinks in hand, to relax by the water and wave to friends and neighbors passing by on the bridle path. Once the basic layout was complete, we began the pleasant tasks associated with pond completion by bringing in plants and developing the pond’s surroundings. We also spruced up the wetland areas, replanting many sedges that had been set aside through the excavation process. Then we sized up our stone placements and took care of fine-tuning flows where we’d set up elevation changes. Not long thereafter, they added a radio-controlled boat to the agenda and then acquired a small rubber dinghy to paddle across the pond’s surface whenever the weather and the mood called for it. They are both accomplished physicians, and it’s good to see they’ve found such effective relief from their day-to-day stresses at the water’s edge. I get calls from them every once in a while with a question about this or that, and we occasionally get together by the pond to enjoy each other’s company and renew what has become a good friendship. But there was one call I received that I will never forget. About two years after we finished the pond, she gave me urgent call to get over there quick because something awful was happening with the pond. When I arrived, I was stunned to see that the liner had risen in the center of the pond to a point where a huge section of black rubber broke the water’s surface! It’s easy to understand why the homeowners now step across their yard almost daily to sit by the pond, visit with passing neighbors, track plant growth, say hello to the fish, check the island for birds and generally take in the splendor of the tableau we helped them create. And the new barn is a perfect bucolic complement to the peaceful aquatic setting. What we discovered is that the backyard’s boggy depression was actually a vent for an underground river that rose and made its presence known after a good rainstorm or with heavy snowmelt. Once we’d consulted with some local experts, we added two sump basins alongside the pond: Their pumps kick on when the water rises and top off the pond (if needed). We also significantly increased the weight atop the liner with some well-placed boulders. There have been no such problems since. It took us about a month to remedy things, and I note my clients’ continuing good spirits as testimony to the value of cultivating good, long-term relationships. Under other circumstances, this sort of incident could easily have led to serious conflict. As it was, the homeowners worked diligently with me to make things right – and we did. Straight through, in fact, this project was a detailed collaboration for me and my clients in which we figured out what we needed to do to make everyone happy: the two of them, the fish, the local wildlife and me – along with a big blue turkey named Hei-Hei.